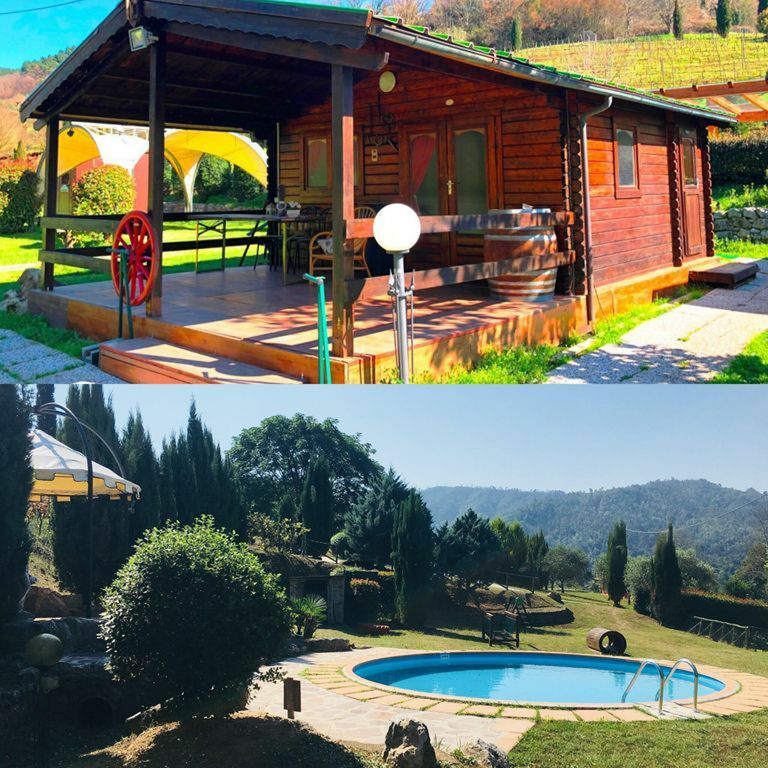 (Chalet, garden and the swimming pool is just for your private use). you will not to share with other guests! A main room with entrance in living room with tv, one double sofa bed. 1 bathroom with toilet, shower and washbasin. Small closet with desk and chair. Outside, just in front (3 meters) is situated a private kitchen with freezer, and 1 table with 4 chairs. Chalet del Golf is furnished with great care and charm following Tuscan style. Further details Outdoor: private garden with private pool. At 15/20 mt from the house, there is a round pool with circumference of 6 meters (you can see it in photos). This pool is very comfortable in a relaxing and calm area. the depth of the pool is about 120 centimeters. Big patio with table and chairs overlooking the surrounding green hills. Barbecue. The villa is situated in a relaxing and calm area surrounded by green hills. The garden is private and secluded. It has his own way to reach the house, and private parking too. The property is superb for outdoor living and too enjoy sunshine from dawn to dusk. It's a very bright area. The garden provide perfect areas for relaxation and for children to play. The house is inside a property that includes golf course and tennis. Cleaning before and after your stay. On your arrival you will be asked for a deposit of 200.00 €. The sum will be returned on your departure. Any damage checked on your leaving will be refunded from the deposit. Linen for bed and bathroom € 10 a person supplementary change. 'Chalet del Golf' is situated at about 500 mt to a village, called S. Martino in Freddana. In the village there are one shop for every genre as a supermarket, a pharmacy, some restaurants, some pizzerias, delicatessen shops, a butcher shop, a bakery, a coffee shop, ice-cream shop, a tobacco shop, a hair salon, Mechanic, Dry cleaners, Edicola, Catholic Church. For what concern tasting wine, we are producer of white and red wine , in fact the vineyard are next to the house! Prepare dinner at home is our specialty! we do this service very often, we prepare it for you, all typical Tuscan dishes! Consider that the tent and the use of it in a Beach club without our agreement is 60 Euro in that area, which is only 25 minutes by car from the house. We advice to book even before arrival to have more possibility , because having 5 properties, it’s so busy. In Lucca the Antique Market, every 3rd weekend of every month. During the summer Lucca welcomes some of the most famous singers in the world for the "Summer Festival" concerts held in the main square of the city. In the area of Monte Carlo (Lucca), a typical medieval village, there are numerous wineries that offer tastings and sell their own wines. Just twenty minutes away are the beaches of Versilia. Apart from Viareggio, famous for its carnival, Forte dei Marmi is a Mecca for shoppers and nightlife. While in the new open-air theater on the Massaciuccoli lake, in Torre del Lago Puccini, 20 km from the villa, in front of the villa where Puccini wrote some of his best pieces, the Puccini Festival takes place. From June to August, the composer's most popular operas are performed in a spectacular setting ..
By motorway or train you can easily reach Portofino and the Cinque Terre in Liguria, characterized by ancient villages bordering on the sea, which represent one of the most beautiful natural sites in the world. In winter the ski resort of Abetone, just an hour's journey, offers facilities and ski runs for winter sports fans. How to get here:: The villa is set in the countryside around Lucca, about 10 km far from the centre of the town. Pisa airport is quite small and you pass through the formalities quickly. An alternative airport is Florence. It is 20minutes from Pisa, 45 minutes from Florence to reach the town. Direct flight from New York (JFK) to Pisa (PSA) operated by Delta Airlines. Take indications from Pisa Airport to Motorway (Autostrada A12) in direction of Genova. Take 1st exit on to Autostrada A11 towards Firenze(Florence) and take the first exit off this motorway for Lucca. Follow indications for city center (centro) and you will see the walls of the city in front of you. Follow signs for Camaiore. Go along this road for 9 km and when you reach San Martino in Freddana turn right for Loppeglia/Fiano and after 1 km you can see from the street vineyards and olive trees. Here enter in the gate of Serbacco Golf Club. This Holiday House belongs to my parents from 1998 .My father restored it few years ago, when I had a degree in literature and Languages in Pisa. It was my dream have contacts with foreign people and practice languages every day. I ‘m so interested to other cultures and I like dealing with people from all over the world. My other passion is cooking, that’s why I organize Tuscan meals and cooking class for my guests. It is a nice experience to taste home-made flavors and preparations. I live quite next the house, this area means a lot for me, here are my origins. I was born here and grew here, I travelled a lot but this is my place, I know its products and the uses of my earth and with my job I’d like to express what really this earth is : its hills, perfumes, green, special food and traditions. This property is the place to know “my” region. Here is a strategic point to have a global view of Tuscany : Arts( Lucca, Florence, Pisa, Siena and all other cities) Beach(Versilia beachside with all his comforts) Mountains ( Abetone )Foods and wine tasting (Garfagnana, Chianti) or just relax and activities( the property has private swimming pool and tennis and golf course) . These are just some example of what our place offers. That means : one hour to reach whatever you are looking for in Tuscany. Enjoy your stay! Tennis and Golf (pitch & putt) are close to the house. We really appreciated the total privacy of the mini chalet, located in an old golf, the small private pool and forest view. The kitchen is in a separate small cabinet just close, it's fun and prevents from the cooking smell. Just remember to have a flashlight. The owners are very charming and helpful, this place has been a real relaxing break. It's also a good location to go to Lucca, Cinque Terre, Pisa, and even Firenze for one day. Thanks so much for your kind comments! It was a pleasure meeting you and we hope to see you again! Lucca with its monuments, squares, fountains, museums; with its tranquil medieval town centre in great part pedestrian, with its theatre, the Teatro del Giglio, and it's esteemed seasons of opera, prose, orchestral music and dance; with its important cultural events such as the Comics Revue and the Summer Festival, the traditional ones such as the procession of Santa Croce during the city's September festivities, or the Flower Market in April. Lucca is a city which offers the tourists attractions of historic interest and natural beauty with the sure knowledge that you can walk through the city and surrounding areas at any time in complete safety. 2000 years of history will catch your eyes walking around Lucca’s squares and streets. It is home to splendid Romanesque churches, museums, monuments, and birth place of Giacomo Puccini (1858) one of Italy most famous composer.